The RSPB is predicting its Big Garden Birdwatch, the annual volunteer survey where bird-lovers around the country log visits to their garden or local park, will be the biggest so far held. With the year drawing to a close, it’s time to think again about taking part in the RSPB’s Big Garden Birdwatch – the annual survey aimed at helping the charity track the rise and fall in wild bird populations. The RSPB has published the results of January’s Big Garden Birdwatch, in which thousands of householders sent in data about visitors to their back gardens or local parks – and the news isn’t good. Were you among the 133,000 people who took part in the RSPB’s Big Garden Birdwatch and have so far submitted their results online? If so, we’d love to hear from you about your experiences. With the RSPB’s Big Garden Birdwatch just days away, the charity is predicting the results will show evidence of the effects of climate change on British garden birds. The next big thing on the RSPB calendar is The Big Garden Birdwatch on January 26-27 2008. 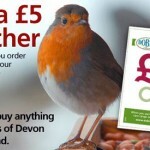 Our store lists hundreds of products aimed at anyone looking to feed the birds that visit their garden. From bulk supplies of seed, to basic feeders, everything you need is there. You can search for what you want, compare prices where more than one supplier carries the same product, and leave reviews to help other shoppers. When you know what you want, just click through to the supplier's site and buy!